Me (with Sippy Cup sitting on my lap): "So what are your jobs again?" Sippy Cup: "Respect the baby." Sippy Cup: "Protect the baby." Sippy Cup: "Love the baby." Me (tousling his hair affectionately): "Good job kid." Sippy Cup (hugging me): "Thanks Daddy." Today, I learned that running a half a mile while carrying a duffel bag in your left hand, a booster seat in your right hand and your 4 year-old son on your shoulders is the quickest way to get to your ZipCar before a surprise thunderstorm can strike. As it turns out, it's also the quickest way to finally convince your neighbors that you have, indeed, lost your mind. Sippy Cup (yelling from the room): "Daaaaad!" Me (sitting at the dining room table reading): "Yes my liege?" Sippy Cup (yelling from the room): "You have to come see what I found!" Me (refusing to fall for his trap): "How about you bring it here and show it to me?" Sippy Cup (running): "Haha! This is awesome!" Me (my head buried in a book): "I'm sure it is." Sippy Cup (standing, stark naked, in the living room): "Look! I found my pirate parts! I found my pirate parts!" Me (putting the book down): "First of all, I didn't know you had lost them. Second of all, I'm pretty sure we've tol...you know what? I'm not even going to correct you. High-five!" Sippy Cup (trying to close one eye): "Aaaarrrrghhh!" One of the unexpected outcomes of writing this site has been the fact that a good number of people have come to respect Sippy Cup's opinion. The majority of these people are our friends and family who find his brutal honesty hilarious and tend to ask him what "...he really thinks of his Daddy". 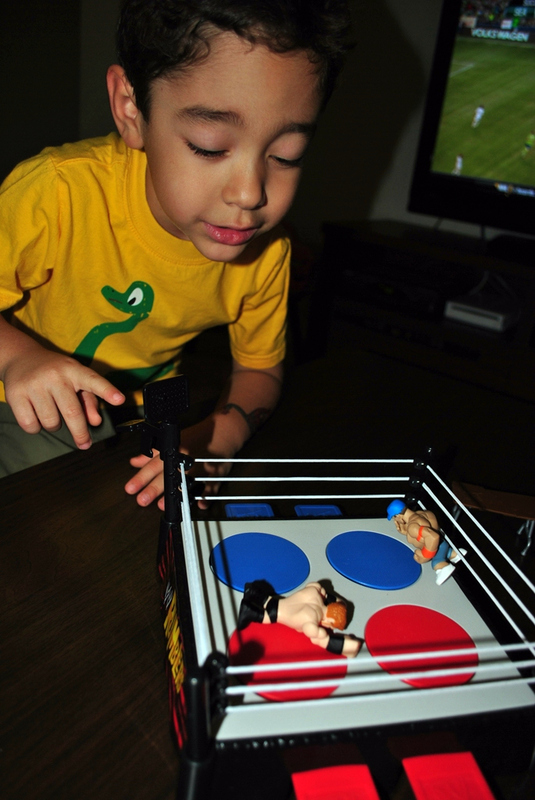 However, a few weeks ago, I received an email requesting Sippy Cup's opinion on something completely different: Mattel's line of WWE toys and action figures. I will admit that (for a split second) I hesitated, simply because I wanted to remain true to the original intentions of this site. But then common sense kicked in and reminded me that a free toy is a free toy and Sippy Cup's honest opinions can be worth more than just laughs for my friends. 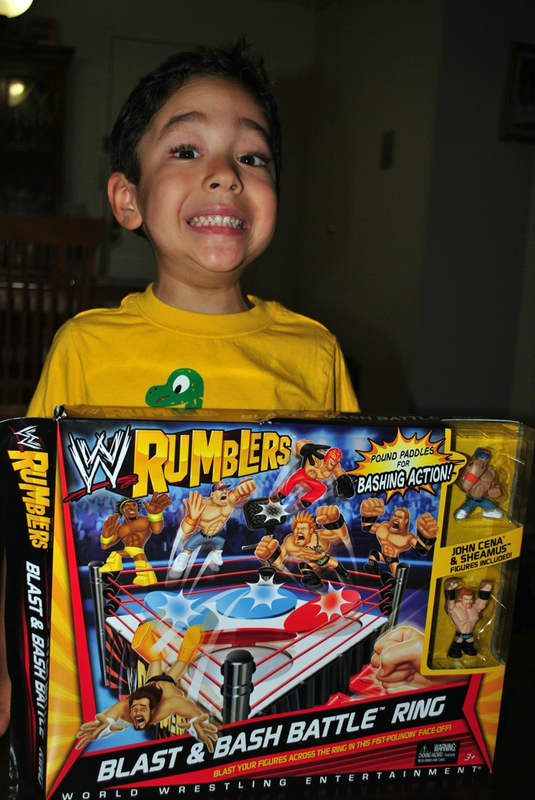 So, thanks to the good folks at Mattel, we received a package in the mail the other day containing two different toys: the WWE Rumblers Blast & Bash Battle Ring and a WWE Defining Moments Figure. I tend to judge the popularity of a toy depending on how long Sippy Cup plays with it. As a 4 year-old, Sippy Cup has the attention span of, well, a 4 year-old so most of our purchases are popular for a few hours at most. 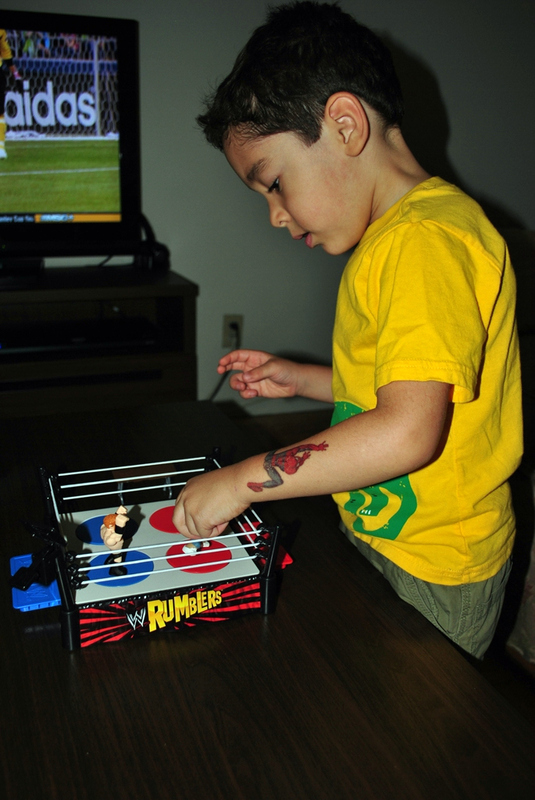 However, even though a few days have already passed, Sippy Cup is still playing with his Rumblers Blast & Bash Battle Ring. 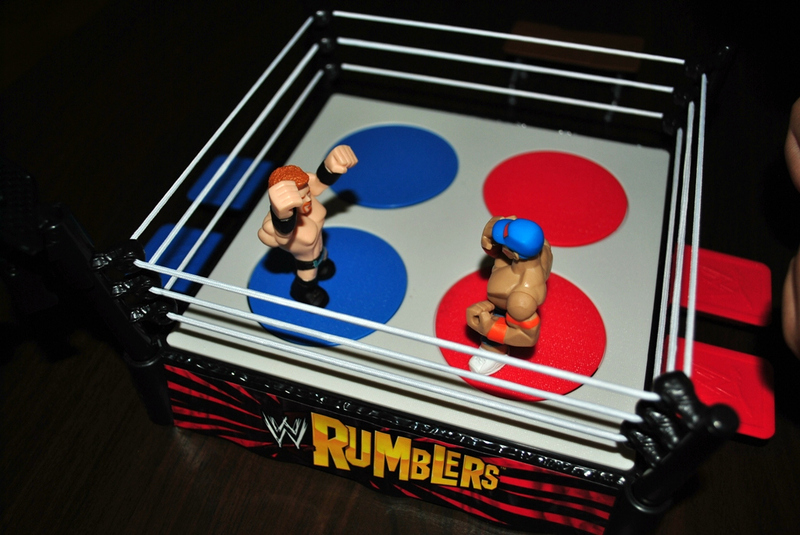 The ring is made of a very sturdy plastic and the ropes have enough resistance to replicate "jumps from the top rope" rather effectively. 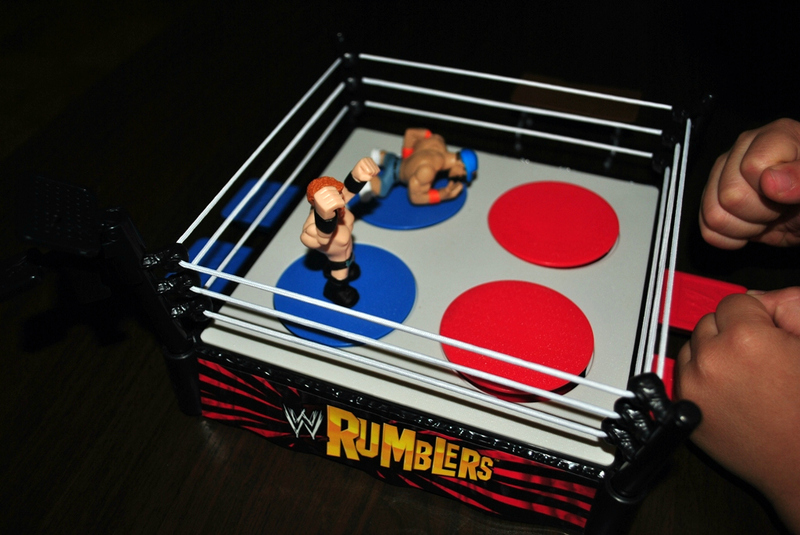 The mini figurines are highly detailed and poseable, allowing for intense and terrifying wrestling matches and ﻿photo-realistic winning poses following the match. 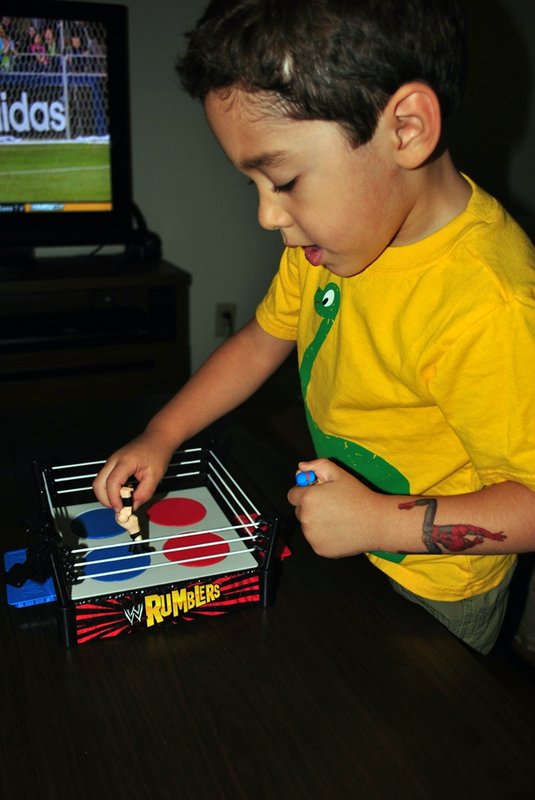 I will be honest and admit that the ring paddles are rather noisy; nevertheless, wrestling is supposed to be a loud and raucous event and Sippy Cup embraced all of the sound effects he was making with joy and enthusiasm. He LOVES this toy. 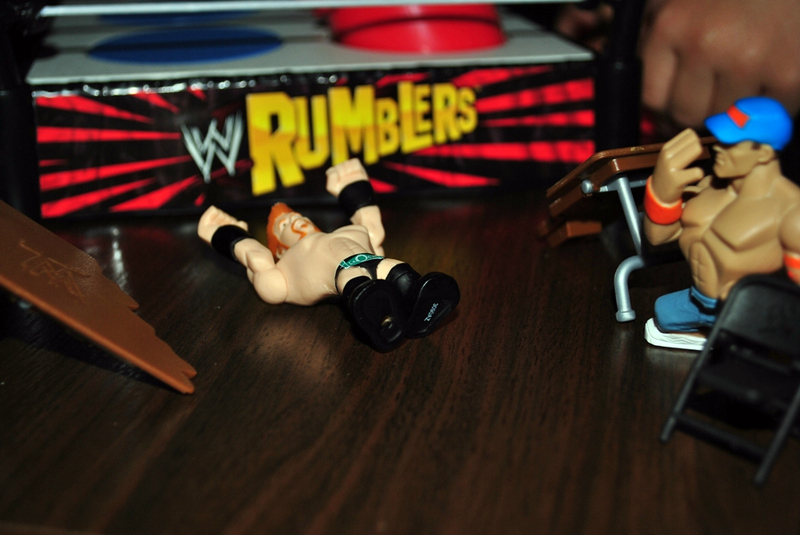 The second toy included in the package was the "Macho Man" Randy Savage Defining Moments Figure. The untimely passing of Randy Savage just a few weeks ago made this moment particularly bittersweet for me as it brought back all of the fond memories of growing up in the heyday of the World Wrestling Federation. 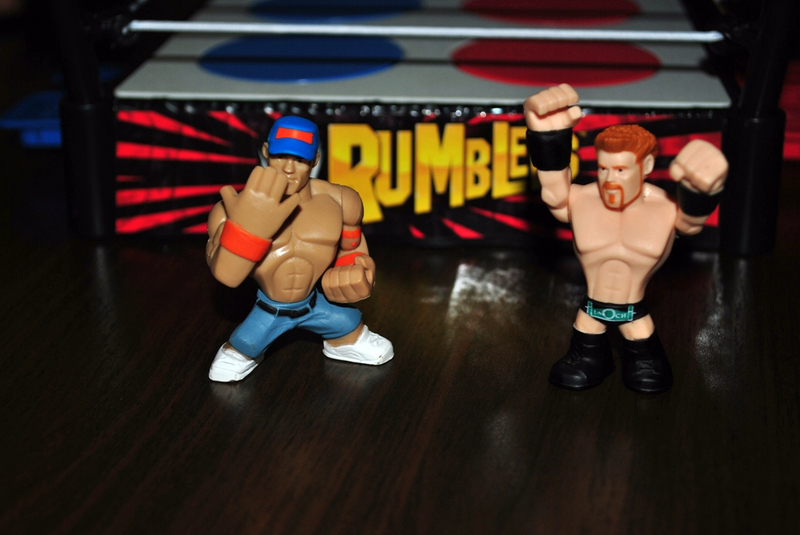 I remember my Saturday mornings were spent watching WWF wrestling matches and trying my best to replicate the flips and tosses on my twin-sized bed. I can vividly recall the rush of adrenaline that I would get when the Ultimate Warrior's entrance music would start playing or whenever Macho Man would scream out his trademark "Oooooh yeah!" The figure features an incredibly high-level of detailing, great articulation on the arms and legs, high-quality fabric for the costume and a display stand. 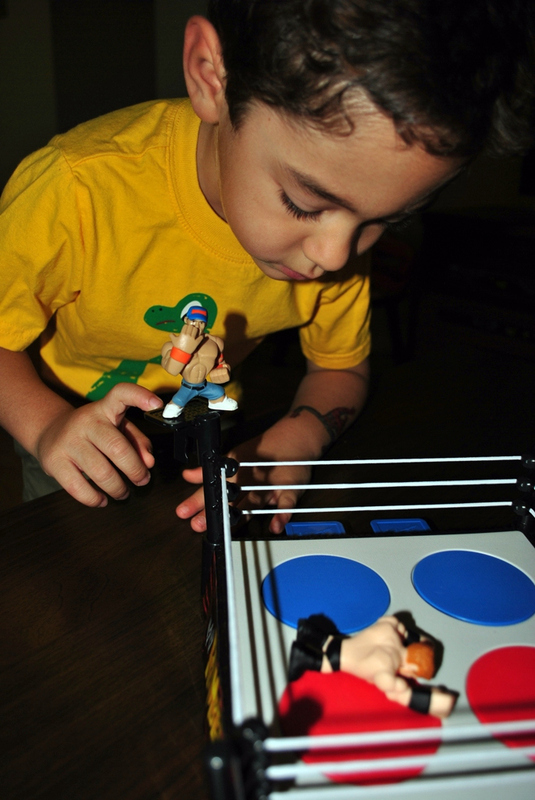 It makes a great gift for the older wrestling fan or anyone who is into sports memorabilia. So, in other words, it makes a great gift for the Dad in your life. Right now, it's 9:45pm on a Friday night. Just a few years ago, right at this time, I would have been waking up from a quick nap, jumping in the shower and getting ready to go out to a bar. Tonight, however, we spent a full hour playing Picture-Words Bingo with the M.O.M. and your grandparents. It was an absolute blast. Our life changes in ways we can never anticipate. But embrace those changes. More often than not, they'll be for the better.